A vegetable with lots of nutrients and health benefits, the Okra is a love it or leave it vegetable. It can be slimy and tasteless when prepared without love. Yet it is delicious with a little hint of spice and when flash cooked on a high heat that can avoid the slime. 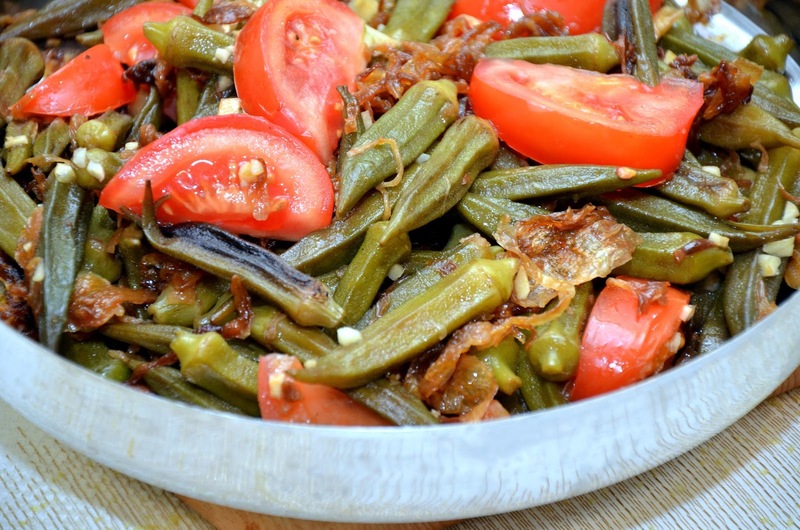 Try this delicious dish and share your thoughts on this vegetable with us. Heat the oil and add the Okra. Cook on a high flame for a few minutes until the water has dried and they start to look slightly brown. Add the spices except for the lemon juice. Mix well and cover. Cook on a low flame for about 20 minutes. Sprinkle a little lemon juice all over before serving. Serve hot with chapattis. While fresh is best, flash frozen okra can be used. Rinse the frozen vegetable, leave it in a collander for a few minutes to drain or use a paper towel to dab dry before starting to cook. The less wet they are the easier it is to get them to be crisp rather than soggy. If you enjoy flavours of the Persian cuisine substitute the chilli and cumin for 1/2 tsp cinnamon and 1 tsp Adiveh powders. For more on Okra click on the link below.